Welcome to the Hot Springs National Park Information Page. Hot Springs National Park is located at Hot Springs, Arkansas in the central west area of Arkansas. The nearest major airport is Little Rock, Arkansas and there is an airport in Hot Springs, Arkansas, Hot Springs Memorial Field. Hot Springs National Park is in downtown Hot Springs, Arkansas. Bathhouse Row is on Central Avenue with the mountains of the park flanking this street. Take I-30 South to Highway 70 West exit just south of Benton to Hot Springs, Arkansas and the park. Take I-40 West to Little Rock, Arkansas then take I-30 South to Highway 70 West exit just south of Benton to Hot Springs, Arkansas and the park. 1. Take I-30 North to Highway 270 West exit at Malvern to the park. 2. Take I-30 North to Stateroad 7 North exit at Arkadelphia to the park. Take I-40 East to Little Rock, Arkansas then take I-30 South to Highway 70 West exit just south of Benton to Hot Springs, Arkansas and the park. You can access the park via I-30, US 70 West, US 70 East, US 270 West, US 270 East, Stateroad 7 South and Stateroad 7 North. Hot Springs is serviced by a local airport, the Little Rock airport (with shuttle service and rental cars), and buses. Amtrak’s Texas Eagle route serves Little Rock and Malvern, Arkansas, with shuttle services to Hot Springs. Congress established Hot Springs Reservation on April 20, 1832 to protect hot springs flowing from the southwestern slope of Hot Springs Mountain. This makes it the oldest park currently in the National Park System–40 years older than Yellowstone National Park. People have used the hot spring water in therapeutic baths for more than two hundred years to treat rheumatism and other ailments. The reservation eventually developed into a well-known resort nicknamed “The American Spa” because it attracted not only the wealthy but also indigent health seekers from around the world. Today the park protects eight historic bathhouses with the former luxurious Fordyce Bathhouse housing the park visitor center. The entire “Bathhouse Row” area is a National Historic Landmark District that contains the grandest collection of bathhouses of its kind in North America. By protecting the 47 hot springs and their watershed, the National Park Service continues to provide visitors with historic leisure activities such as hiking, picnicking, and scenic drives. Hot Springs Reservation became Hot Springs National Park by a Congressional name change on March 4, 1921. The hot springs are a special natural resource. The tradition of drinking the water and using it for bathing continues today, just as in days past. 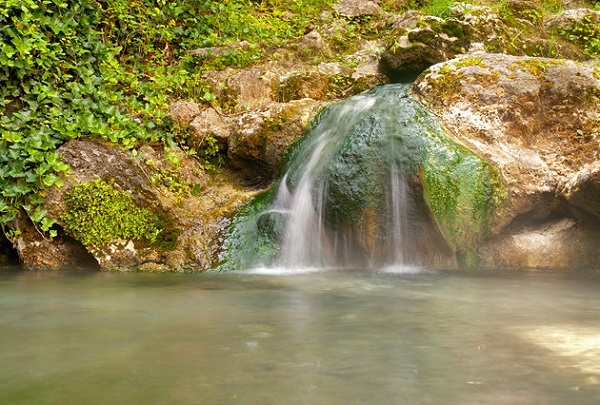 The pure tasting and orderless water of Hot Springs National Park has long been considered among the country’s best. The park maintains several thermal water jug fountains and two cold spring jug fountains. Many visitors and local residents collect the water in jugs and take it home with them. Water is what attracts people to Hot Springs. In fact they have been coming here since the first person stumbled upon these springs perhaps 10,000 years ago. Stone artifacts found in the park give evidence that Indians knew and used the hot springs. For them the area was a neutral ground where different tribes came to hunt, trade and bathe in peace. Surely they drank the spring waters too, for they found the waters with minerals and gases have a pleasant taste and smell. These traces of minerals, combined with a temperature of 143 F, are credited with giving the waters whatever therapeutic properties they may have. Waters from the cold springs, which have different chemical components and properties, are also used for drinking. Besides determining the chemicals composition and origins of the waters, scientists have determined that the waters gushing from the hot springs are more than 4,000 years old. And the waters gush at an average rate of 850,000 gallons a day. The historic Bathhouse Row area may be seen in two hours. Allow longer to enjoy the hiking trails, scenic drives and evening summer programs. Gulpa Gorge Campground is located on Highway 70B, approximately 0.5 miles north of highway 70 East. It is located on the east side of the park. There are no showers, electrical hook- ups or water hook-ups. Camping limit is 14 days in a calendar year. Commerical and state park campgrounds in the Hot Springs area offer complete facilities. There are no admission fees. Donations are accepted in the donation bottle in the lobby of the Fordyce Bathhouse Visitor Center. The park is in the middle of the city of Hot Springs. There are local restaurants and grocery stores as well other stores. There are approximately 26 miles of day-use hiking trails in the park (mountain bikes are prohibited); there are two scenic mountain drives on West Mountain and on Hot Springs and North Mountains. An observation tower on top of Hot Springs Mountain is operated by a concessioner. There are picnic tables on the Grand Promenade, Hot Springs Mountain, West Mountain and Gulpha Gorge. Take water on longer hikes. Be alert to avoid contact with poison ivy, ticks and stinging insects. Be alert for snakes as the park is home to copperheads, cottonmouths and rattlesnakes. If you see a snake on the trail, give it plenty of room to escape. Tell someone where you are going and when you plan on returning. All hiking activity will be restricted to designated trails and walkway systems; “shortcutting” is prohibited. Collecting the following fruits and nuts for personal consumption only is permitted: plums, blackberries, hickory nuts, persimmons, grapes, muscadines, blueberries, and juneberries. The use or riding of skateboards or similar devices on walkways within the Bathhouse Row Historic District is prohibited. The use of a bicycle is prohibited except on park roads or in parking areas. The riding of a bicycle within the Bathhouse Row Historic District is prohibited. There are no permits or licenses needed. Camping fees are $ 10.00 per night ($ 5.00 for those having Golden Age or Golden Access Passports) at Gulpha Gorge Campground. Reservations are not taken for Gulpha Gorge Campground; it is on a first-come, first-served basis. Two weeks notice is preferred for scheduling a special tour for a group. Call 501-624-3383 x 640 for information. There is a fee charged for the Hot Springs Bath or Spa facilities. These two seasons are mild with some humidity, a light jacket is recommended. Summer is hot and very humid in summer, wear comfortable clothing. Winter is variable–temperatures may range from below freezing to the 60s, with some humidity. Be prepared for cold weather.